Another way to use a classification system is to consider if there are other possible values that could be used for a given dimension. Future direction: Identify additional sample values and examples in the literature or in situ to expand the options within each dimension. For researchers looking for new avenues within human computation, a starting point would be to pick two dimensions and list all possible combinations of values. Future direction: Apply two different human computation dimensions to imagine a new approach. These properties formed three of our dimensions: motivation, human skill, and aggregation. These dimensions were inductively revealed through a search of the human computation literature. They contrast with properties that cut across human computational systems: quality control, process order and task-request cardinality. A subtle distinction among human computation systems is the order in which these three roles are performed. We consider the computer to be active only when it is playing an active role in solving the problem, as opposed to simply aggregating results or acting as an information channel. Many permutations are possible. The classification system we are presenting is based on six of the most salient distinguishing factors. These are summarized in Figure 3. Per the authors, "collective intelligence is a superset of social computing and crowdsourcing, because both are defined in terms of social behavior." Collective intelligence is differentiated from human computation because the latter doesn't require a group. It is differentiated from crowdsourcing because it doesn't require a public crowd and it can happen without an open call. No human is involved in the extraction of data via a computer. Humans perform a social role while communication is mediated by technology. The interaction between human social role and CMC is key here. 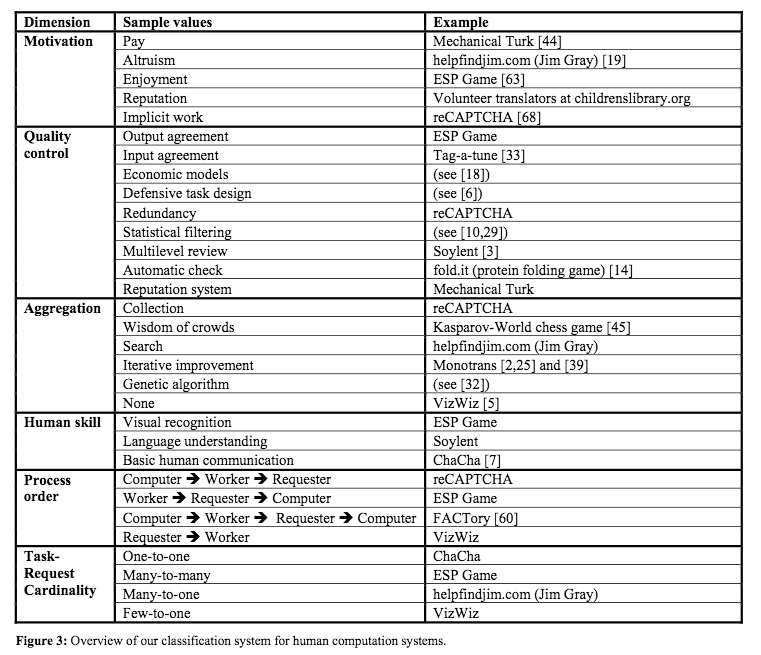 The intersection of crowdsourcing with human computation in Figure 1 represents applications that could reasonably be considered as replacements for either traditional human roles or computer roles. Labor process of worker replaced by public. Problem solving by human reasoning and not a computer. When classifying an artifact, we consider not what it aspires to be, but what it is in its present state. Criterion for determining when/if the artifact is a product of human computation. human computation does not encompass online discussions or creative projects where the initiative and flow of activity are directed primarily by the participants’ inspiration, as opposed to a predetermined plan designed to solve a computational problem. What human computation is not. The authors cite Wikipedia as not an example of human computation. "Wikipedia was designed not to fill the place of a machine but as a collaborative writing project in place of the professional encyclopedia authors of yore." 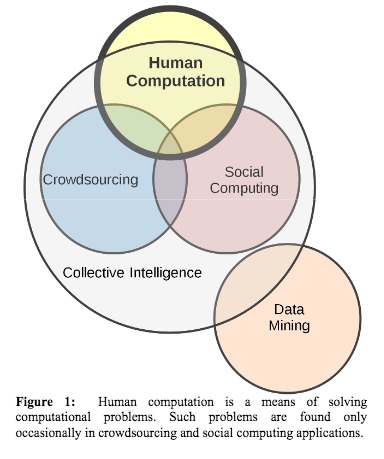 Human computation is related to, but not synonymous with terms such as collective intelligence, crowdsourcing, and social computing, though all are important to understanding the landscape in which human computation is situated.